NAPOLEON! this is an Italian Dessert that I just love so much, its so delicious from top to bottom layer. 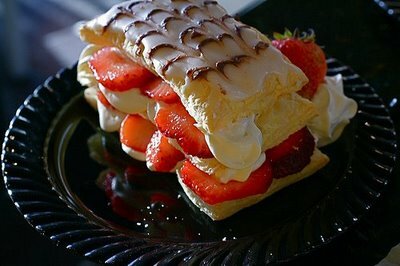 Most bakeries carry the Napoleon, because it is a common and popular pastry dessert :) The ingredients are pretty basic...chocolate, water, vanilla pastry cream, pastry, and powdered sugar, you can also add some fresh fruits like strawberries, bananas and blueberries. I must admit, I have never made a Napoleon, but it is on my list of to bake! So next time you have a sweet tooth and want to try something new, try a Napoleon!